This month on the Canadian Food Experience Project, we were asked to write about a Canadian Farmer or Producer that we believe is quintessentially Canadian. I found it hard to narrow down just one producer to write about. There are so many farmers and producers that make all of my favourite local foods and if you’ve been following along with my blog, you would definitely have encountered one or two over the years. I left it up to fate and headed to the market, armed with phone as a camera and a voice recorder. I decided that I would write about the first producer I encountered. I was very lucky that my favourite chicken farmer, Ron Hamilton of Sunworks Farms was at the Strathcona Market, as he is every Saturday. You can always find him behind his portable BBQ at his booth, cooking up some of his famous chicken sausages. He had some time to stop and chat with me. Ron and Sheila believe that everyone needs good, clean, real pure food, and that is why they are a certified organic and a certified humane farm (an animal welfare certification I didn’t even know existed until I chatted with Ron.) They are also working on building the first certified humane poultry processing plant in Canada. They feed their animals only organic feed and even have their own certified organic feed mill. They have a butcher shop close to their farm in Camrose, where they break down the chickens and make all of their products. They also produce beef, pork, lamb, turkey and eggs. They have quota for their chicken, turkey and eggs, which allows them to grow and make sound financial decisions for their family and their farm. (For some background on the quota system, check out Alberta Supply Management.) With the freedom to grow under supply management, Ron wonders where he should stop. He uses his values as a benchmark for when to quit, and he would quit before compromising those values. By working to his values in agriculture, he is able to gain his consumer trust in what he does. 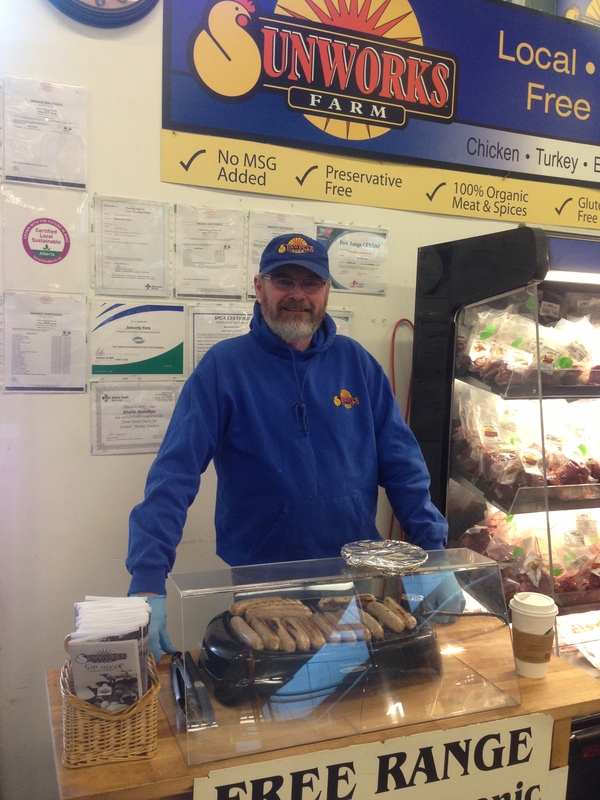 Next time you’re at the Strathcona market, pop by Ron’s booth for some good, clean, pure, real food. I would also highly recommend the Rosemary and Garlic chicken sausages (maybe try them in some homemade mac and cheese?) They are to. die. for! 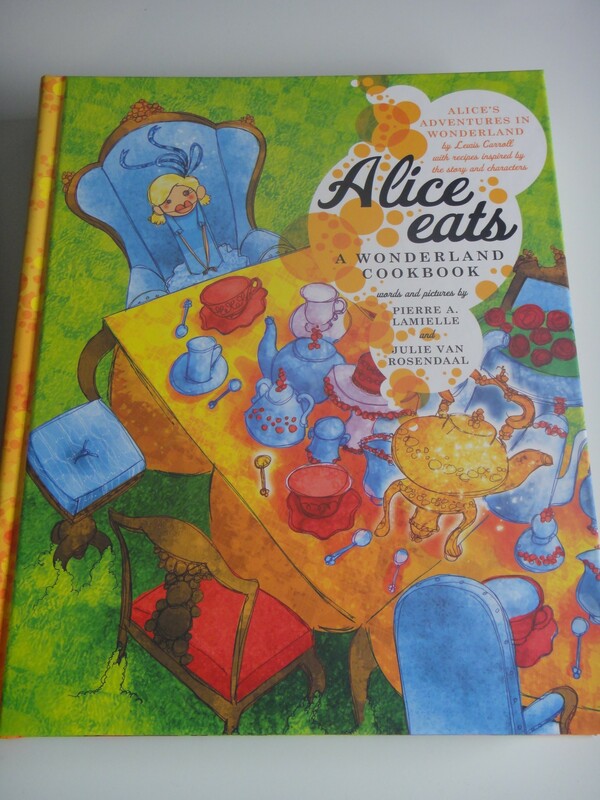 I had received Alice Eats for Christmas, and had not yet had the opportunity to crack her open. I am so happy I got the chance this weekend! My sister was already making cucumber sandwiches. 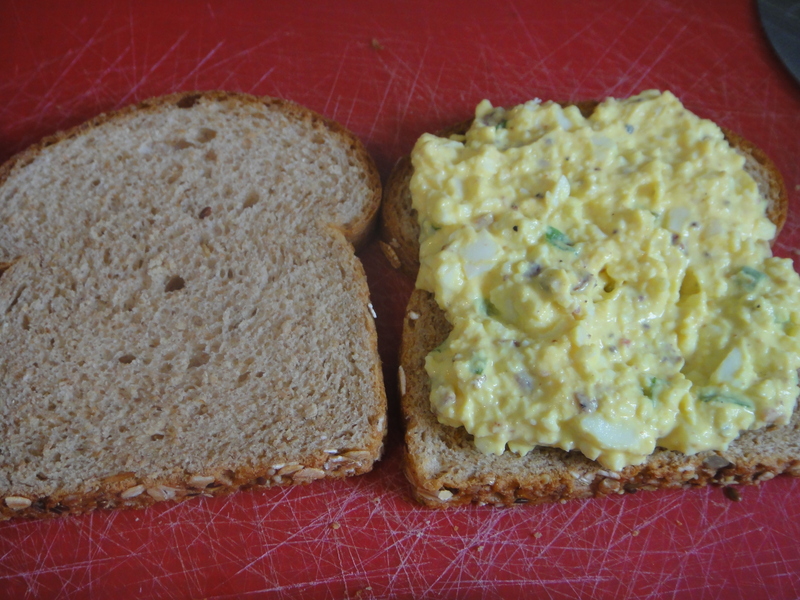 So I decided to try my hand at Julie’s “Alice’s little girl bacon and egg salad finger sandwiches.” While I had to modify them, because my nieces are allergic to the raw eggs in mayonnaise, they were truly incredible sandwiches! First things first, pop your eggs into a large pot, cover with cold water, and bring to a boil. I was also making a veggie tray for the party, so I decided to dice some celery very small and throw it into the bowl for the sandwiches. The recipe also called for green onion, so while the eggs were boiling, I thinly sliced some green onion stems too. Les voila, waiting for their egg friends. 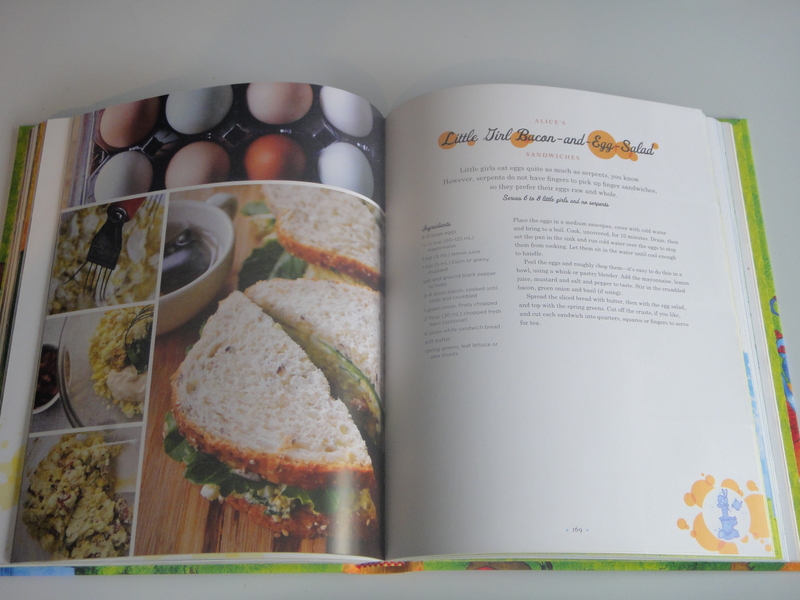 In the recipe, Julie suggested running the eggs under cold water and then letting them sit in cold water until cool enough to handle. Smart idea! It certainly sped up the process. Peel all of the eggs and throw them in the bowl with the chives and celery. Using a potato masher, I minced the eggs into a tasty pulp. Here they are, all ready for the sauces that will hold them together. I diced up some bacon that we had made for breakfast that day and threw it in with the eggs. Then I began to put together the sauce. As I mentioned, the girls are allergic to the raw eggs in mayonnaise, so I had to come up with a alternative. Scanning the fridge, I found sour cream & plain yogurt (perfect! ), so I threw those into the mix. Then I added the grainy mustard and added some prepared mustard as well, because both my my nieces love the stuff (I know, right?). Trying to imitate mayonnaise is tricky – you need the perfect balance of zippy and sweet. 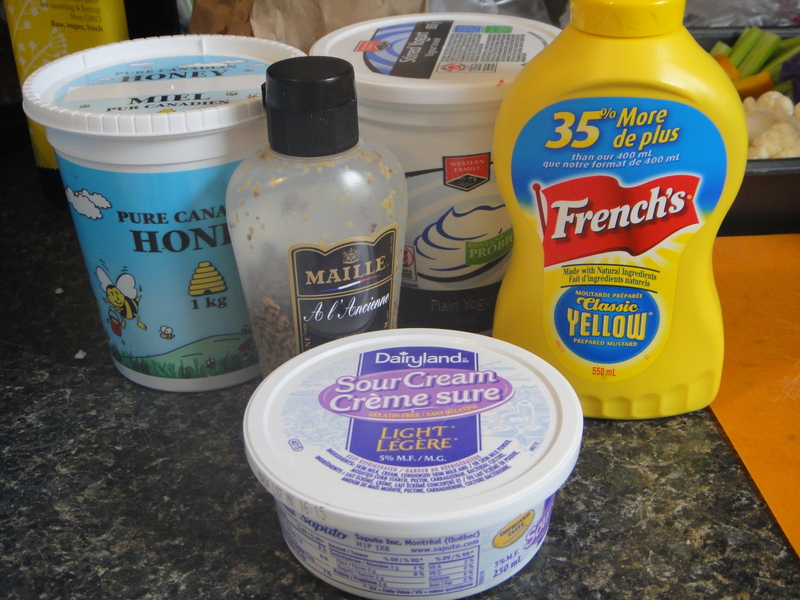 I got the zippy down pat with the sour cream, yogurt and mustards, but then I just needed the sweet – and who doesn’t love a honey little honey with their mustard? After another taste, I felt like I had nailed the flavour profile of mayonnaise, without the raw egg! In the sauce went to the mix. 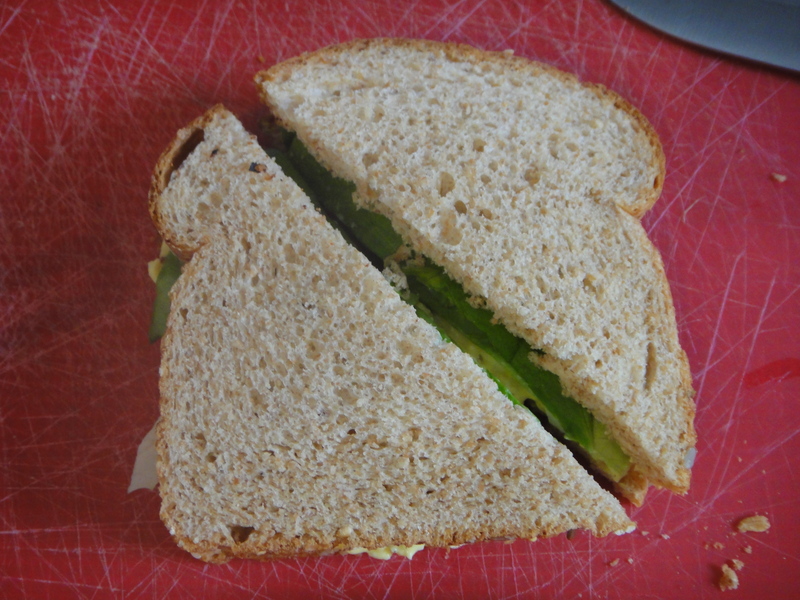 For layering the sandwiches, I took two pieces of whole grain bread. Heaped on a generous amount of the salad. Topped with butter lettuce from the market. Then sliced it in half. I made a lot, hoping they would be a hit at the party. They turned out so well that Justin was thrilled there were leftovers from the party! We got to take them home and enjoy them all to ourselves. Place the eggs in a large saucepan/pot and cover with cold water. Bring water to a boil and cook, uncovered, for 10 minutes. Drain, then set the pan in the sink and run cold water over the eggs to stop them from cooking. Let them sit in the cold water until cool enough to handle. While the eggs are cooking, mince celery, green onion and crumble bacon. When eggs are cool enough to handle, peel and place them in the bowl. Roughly chop them using a pastry cutter or potato masher. Add your sauces and stir well to fully incorporate. 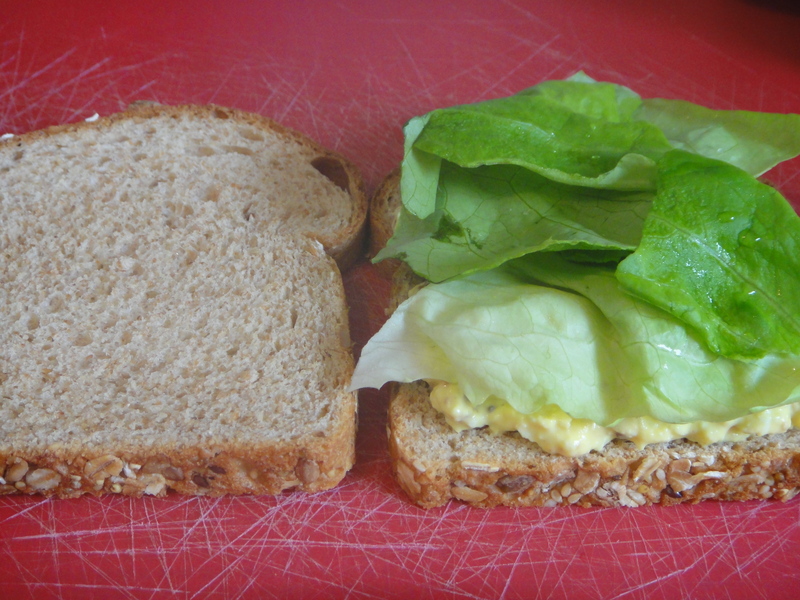 Assemble sandwiches by layering salad and butter lettuce. Cut into quarters or halves to serve for a wonderful little girl’s fifth birthday party.